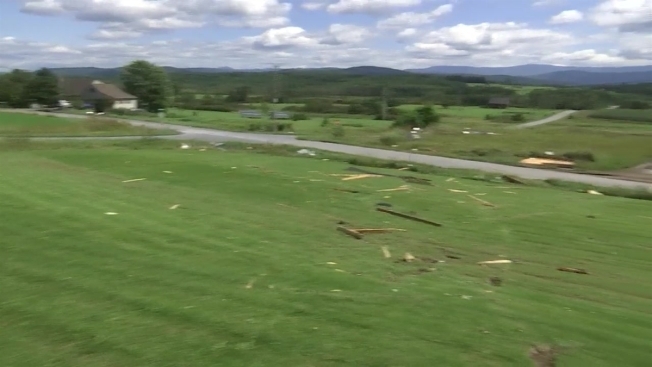 Wednesday was a long day of cleaning up for some residents of Vermont’s Addison County, after their property was hit hard Tuesday night by ferocious winds. “I looked out and was like, ‘Holy cow! What just happened?’” recalled Tammie Booska of Ferrisburgh. What she heard during the heavy rain and thunderstorm was a collapsing storage structure across the driveway from her home. After the storm subsided quickly, she said it became obvious that some classic tractors underneath the storage barn were dented or left with bent parts. A pickup trucked parked underneath the wooden-framed building was slammed by falling boards. Booska’s children’s swing set was leveled, and pieces of the wrecked property were blown far up a hillside behind her home. Wind gusts in the Champlain Valley hit 50 miles an hour Tuesday night, but in isolated spots, some blasts of wind were even more ferocious. “It was a wild night,” recalled farmer Allan Brisson. One of Brisson’s barns had its roof peel right off, as if it were a can of cat food. Mangled metal then wrapped around trees. “Stuff really flew off there with a lot of force,” he said. Only two horses were inside the barn when the roof blew off, and they were uninjured, Brisson said. The farmer noted he had insurance that he expected would help him get through the challenging cleanup and repairs ahead. A section of that horse barn’s destroyed roof landed in neighbor Ron Bachand’s tomato patch. “Quite the mess,” Bachand said, looking out over debris he had to clean up. Bachand spent Wednesday hauling away the debris that landed in his yard. He was still stunned at how one of his trees snapped, then scraped along the ground, apparently threading its way clear through a pair of solar panels, without damaging them, before landing on the ground with most all of its branches intact. Affected residents said they hope to not witness a repeat of this display of Mother Nature’s power.